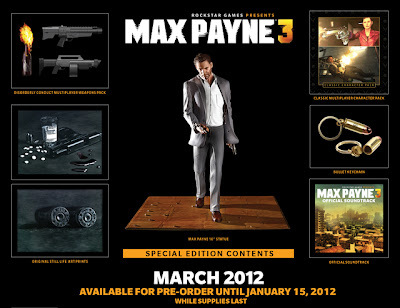 • A copy of Max Payne 3. • 10” tall Collectible Max Payne Statue created in a collaboration between TriForce and Rockstar Games. • Series of game-inspired Original Still Life Art Prints that depict some of Max Payne’s inner demons and vices. • Copper and brass-plated iron, bullet-shaped Bullet Keychain featuring a screw-off back. 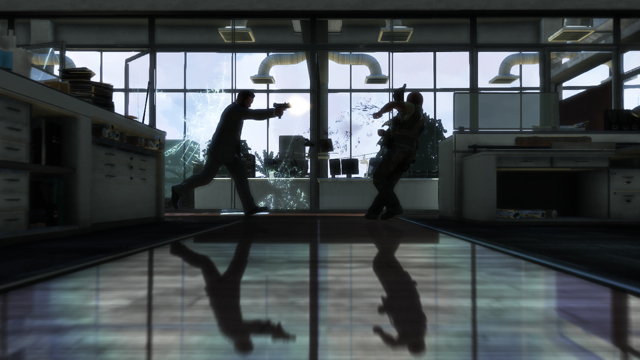 • Classic Multiplayer Character Pack of eight playable multiplayer characters for Max Payne 3 Multiplayer, including fan favorites from the original Max Payne and Max Payne 2 like Max Payne from Max Payne 2, Mona Sax and Vladimir Lem. • Disorderly Conduct Multiplayer Weapons Pack for Max Payne 3 Multiplayer that includes the Hammerhead Auto Shotgun, G9 Grenade Launcher and Molotov cocktail. • Max Payne 3 Official Soundtrack featuring the game’s instrumental score. If you're looking to grab all of this content, be sure to get your preorder in soon!